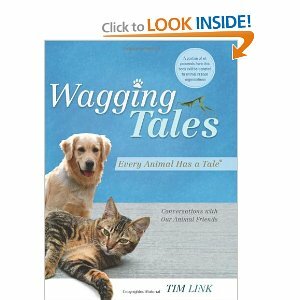 I recently finished reading Wagging Tales: Every Animal Has a Tale by Tim Link. 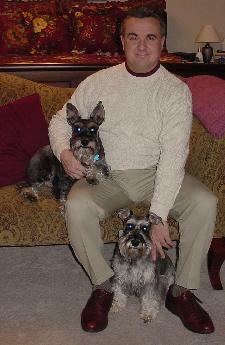 Mr. Link is a self-professed animal communicator who uses his special skill to help owners understand their animals better, and to help animals be understood. According to the author, he is able to communicate telepathically with animals to interpret their innermost thoughts fears, and anxieties. I admit that when I started reading the book, I expected sappy stories and ridiculous dialogues betwen Mr. Link and his animal subjects. I was very surprised to discover how wrong I was indeed! The author describes how he doesn't so much have conversations with animals as he interprets their emotions and subtle communications. For example, he may hear the animal "thinking" a certain word over and over again, or a brief phrase. He then analyzes these messages in context to understand what the animal is attempting to convey to him. Many of the stories in the book are about cats, so as you might expect there is very little by way of sappy conversation. It is mostly utilitarian communication. As a cat lover myself, I certainly wouldn't expect anything more from felines! The biggest shocker to me when reading this book was the overall lack of "a happy ending." I was truly expecting the stories to end with the majority of behavioral problems solved, animals and humans happy, and all would be right with the world. Instead, there is an overwhelming majority of stories that end with adopted pets being returned to the shelter, pets running away, pets remaining long-term in the animal shelter, etc. This is in no way an indication of a lack of skill from Mr. Link; instead, it is a sad reminder of how uneducated many people are when it comes to pet ownership. There are examples abound in Wagging Tales of pet owners who jump feet-first into adopting an animal with little regard for the animal's mental well-being. One such example can be found in the first story of the book, "The Gang Finds a New Home." A family decides to adopt four cats at once, and lo and behold, the cats have behavioral problems and trouble adjusting. Though Mr. Link makes suggestions to the family on what they can do to acclimate the cats, two of the four cats are ultimately returned to the shelter after several weeks as they "did not adjust quickly enough." This is a perfect example of how little patience people often have with new pets, and how a little knowledge goes a long way to happy, healthy pets. One enjoyable aspect of Wagging Tales is that each story begins with a photo of the animal being written about. It is nice to put a face to a name! The rest of the layout, however, leaves much to be desired. The font is comically large, almost to the point of being distracting and difficult to read. Many of the stories seem quite repetitive, and aren't so much stories as a few sentences without much of a resolution. Towards the end I was almost *begging* for some of the sappiness I was initially dreading! The author's simplistic style makes the book a breeze to read, but the style also hinders it in that the stories somewhat plod along and never really take off. I personally would have liked to hear more commentary from the author's point of view instead of a clinical recanting of who, what, when, where. I have to think that the author has experienced strong emotions about the way some of the stories turned out, and the book certainly could use more of his insight. Personally, I don't believe Wagging Tales is going to pique the interest of serious pet enthusiasts; instead, many would be frustrated (as I was) with the amount of human ignorance described within. This is the kind of book that would be entertaining to those with mild interest in animal communication, psychic phenomena or with a short attention span. It would make a great book for the waiting room of a veterinarian's office, or a coffee table book. By no means is it "must have" reading material for avid readers. A portion of proceeds from sales of the book do go to animal rescue organizations, however, so given as a gift it would truly be "a gift that keeps on giving". Stop by any Mounds Pet Food Warehouse location this December 2010 and contribute to the wish list for the Dane County Humane Society. 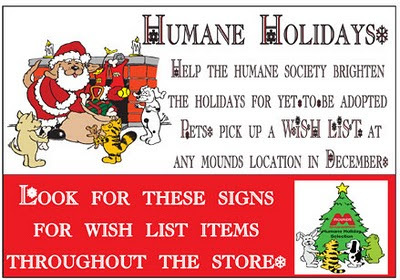 Buy any item on the wish list and Mounds will deliver it to yet-to-be adopted pets this holiday.